Just this side of Heaven is a place called Rainbow Bridge. It is called the Rainbow Bridge because of its many colors. When an animal dies that has been especially close to someone here, that pet goes to Rainbow Bridge. There are meadows and hills for all of our special friends so they can run and play together. There is plenty of food, water and sunshine and our friends are warm and comfortable. them in our dreams of days and times gone by. The animals are happy and content, except for one small thing: they each miss someone very special, someone who was left behind. Last edited by Irisesdad; 11-25-2005 at 12:16 PM. There are many 4-legged friends that I hope to see again at the Bridge. All Creatures Great and Small The Lord God Made Them All. I can't wait for the day that I can be with Micah and Winston again. 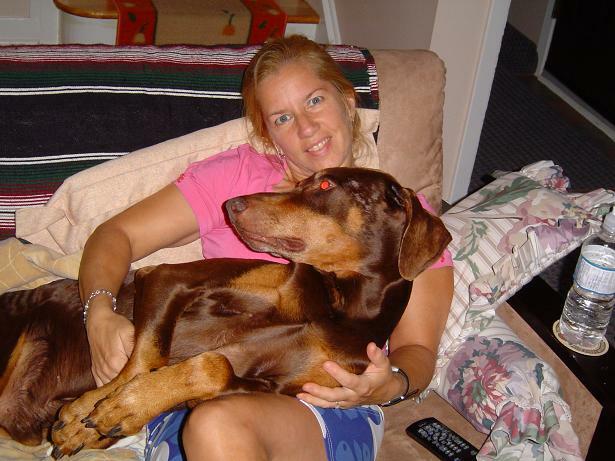 We lost our 11 year old Dobe, Rustie to heart disease just before Christmas this year. It was a long hard fall trying to keep him comfortable. He is sadly missed by all of our family, especialy Lizzie, his kittty. I have to thank those of this site for giving me a place to remember him, begin to heal and look forward to our next Doberman. Thank you, Thank you ... Thank you! I lost my baby boy Zeus two days before thanksgiving, and my world came crumbling down. I have tears in my eyes whenever someone mentions him, and my heart is acking. He will forever be in my heart. Everyone at the vets office all cried when they had to put the gentle giant down. He has a place in my heart forever. RIP Zeus. we will meet at the rainbow bridge someday. We lost our red dobe because someone actually drove up on the sidewalk to puposely hit her. She was walking calmly right next to to us. She died at the emergency vets office about 20 min later. We didnt get the license plate number because we were focused on trying to save Guinevere. People who dont know how fabulous dobies can be should just walk away. This happened ten years ago and still hurts. We have a black dobie now, Tesla, who is also fabulous but we will always miss Guinevere.